As I was getting dressed yesterday before coming to work I noticed some fluttering in the trees near where I live and ordinarily I wouldn’t pay much attention but on this occasion the birds fluttering in the trees were very distinctive because their plumage matched up with the fresh spring foliage. It comes as a surprise to many to learn that London is the home to several large colonies of feral parrots, they’re particularly evident in the summer months. The total number of wild rose-ringed parakeets alone is estimated to be well over 6,000 individual birds. Furthermore, there is some debate as to their origins. According to pets4homes the fanciful origins vary wildly including the suggestion that a flock of the birds escaped from London’s Ealing studios during filming of the African Queen, that a container of the birds fell open at Heathrow airport, and that a large aviary collapsed during the storms of 1987, releasing a significant number of the birds into the surrounding area. The ForteanTimes suggested that there is even a myth that they were descendants from a forced release of a flock by Jimi Hendrix in the 1960’s. 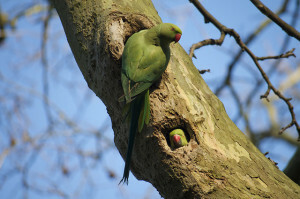 According to an article from the BBC fugitive parakeets have been spotted nesting in the UK since the 19th Century. Even though there was a wild population in the 1960s, the numbers remained very low through to the mid-1990s, when the population appeared to start increasing more rapidly. None of the aforementioned theories as to their origins have been verifiable. For most residents of London they are a novelty and so we’re largely indifferent. When their numbers become as prolific as those of the pigeons and they become as pesky, that indifference may change. The important lesson from the parrots is that our environment is constantly evolving. The assumptions that I have about my surroundings today will not necessarily hold true tomorrow. A protracted sever winter one year could exterminate a large number of these parrots and they wouldn’t be some commonplace anymore. The same also holds true for the other aspects of local gardens and trees. While many varieties or plants and trees are indigenous to the British Isles there are a great many that are alien. There are loads of examples of changes in our environment by well-meaning citizens trying to address issues or challenges or simply to change the way things are. These peoples’ actions can sometimes become a point from which there is no return – something for which there is ‘no undo’. Examples include the proliferation of deserts, floods, diseases and infestations as well as the extinction of entire species through human missteps. Many of these transitions and mishaps are attributed to greed, progress or lack of vision. They are, ion a phrase – unexpected eventualities. Dealing with systems, particularly enterprise systems represents a very similar situation. The anxiety about uncertain outcomes is part of the reason that the idea of ‘rip and replace’ approaches to dealing with enterprise technology rarely happen and cannot be effected easily overnight. This, despite the fact that new management and old management often wish that there were something that they could do to address systems challenges. Companies like SalesForce have built a reputation by being supportive of organizations leveraging their technology in whatever way they prefer. What this means for many organizations is that they can transition to a proven technology in an incremental way and don’t have to make a wholesale switch overnight with any big risks. This is achievable because the functionality on offer is only a sliver of all the possible functionality offered by a full blown ERP system. Similarly, pulling out the HCM component from your ERP and going with a cloud solution only impacts a sliver of functionality. Re-homing your Plant Maintenance functions too, in something like Maximo can potentially bring big benefits to the field engineers without completely ruining the way the rest of the organization uses ERP. All of these solutions would argue this is possible because they address specific functional requirements in an elegant and effective way and that make switching very compelling. Just as there are many companies looking to best-in-class or best-of-breed solutions to address particular requirements of the business there are many organizations that are desperately trying to consolidate their systems. These organizations rationalize that fewer systems hold the promise of working in a more tightly integrated way and reduce the overall cost of ownership. The argument goes both ways. The important thing about dealing with our environment and systems is being aware of the options available. Organizations that want to keep up with the pace at which society and business is changing need to be constantly evaluating what is available – the landscape is constantly changing. Winshuttle has been helping companies evolve and transform their business functions in a variety of ways. The most important of these is facilitating the support of using the data staging environments that make the most sense. Winshuttle technology supports staging data not only in web forms on SharePoint but also Microsoft Excel and Access. Importantly, Winshuttle also supports bidirectional interaction with your key systems and enables you to layer your systems with added functionality in a way that can run in parallel with your existing processes and approaches to working. Unlike the introduction of non-native flora and fauna to the ecosystem, using Winshuttle with core ERP enables you to make controlled changes faster and incrementally. You can make those changes in only those functional areas where you want to make the biggest impact with the lowest possible risk.